You will not find a Caesar salad at Jose Garces’s new Argentine steak house, Rural Society. 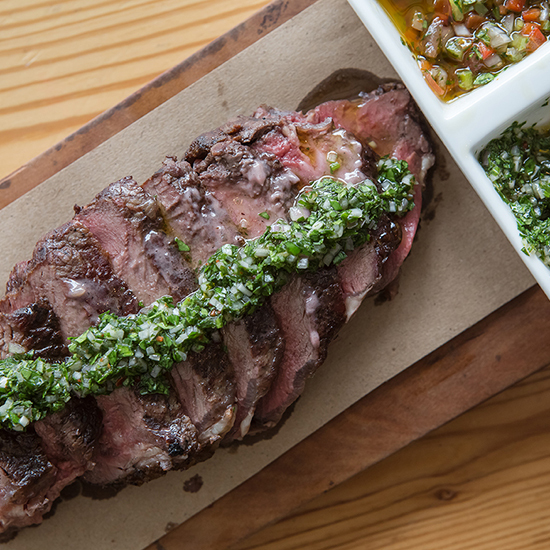 You will not find a Caesar salad at Jose Garces’s new Argentine steak house, Rural Society. There's no creamed spinach, nor a wedge salad. And though the place offers plenty of juicy, dark-crusted beef, there's not a broiled T-bone in sight. The Iron Chef is not dissing these classic chophouse offerings. As a born and bred Chicagoan, marbled beef and hash browns practically gallop through his veins. Rural Society is just a different sort of spot. It’s a little sultry. It's sausage-forward. It is slightly obsessed with quail egg. Its vibe is decidedly more Modern Family than Mad Men. But the biggest point of distinction is the fact that the food—matambre tenderloin seared with ash, stuffed pork tenderloin, melt-in-your-mouth Picanha Wagyu and even sturdy root vegetables—is cooked on a custom-designed parrilla that can only be descibed as the the Tesla of open-flamed grills. Cooking over aromatic hardwood (hickory and oak), desde la parrilla is a game changer in the flavor arena. Super high heat locks in juices and imparts smokiness that you just can't get from a standard broiler. It comes down to this: In a town smothered with top-of-the-line beef joints, Jose Garces has disrupted the steakscape. Chicagoans will come for the carne and come back for the charred Tasmanian trout. The Gaucho sausages. The cha-cha-cha cocktail. Chicago is your hometown. How does it feel to be back? Chicago is a great city. I grew up on the northwest side of the city, went to Gordon Tech (now DePaul Collge Prep) and was classically trained at Kendall College. The food at Rural Society is hearty, wholesome and clean. I know that Chicagoans will appreciate this concept. There are hundreds of steak houses in Chicago. What is the Rural Society difference? Most steak house experiences are similar. You get your rib eye, mashed potato, creamed spinach and piece of pie. Here, we deconstruct classic steak house dishes and add Argentine flair. Cooking with the parrilla grill gives authenticity to what we are doing. We pull the smokiness from the grill into the food, which adds an entirely new level of flavor. Condiments have a starring role at the restaurant. How are yours different? We like to play with acidity and bold flavor. The condiments give us the edge. The ember-cooked beets are set off with puffed, toasted coriander, peppercorns, dehydrdated olives and an orange-coriander-citrus vinaigrette. Our charcuterie is accented with house-made carrot mustard. The chimichurri sauce and salsa that is served with bread adds depth to anything on the menu. Sourcing local ingredients (and supporting the local purveyors) is important to you. Who are you championing in Chicago? We are using West Loop Salumi for artisinal charcuterie, Z Baking Company for bread and Urban Till for herbs and micro greens. Our coffee is from Garces Trading Company. My father is the roaster! There are pizzas, pastas and charcuterie on your menu. Why so many Italian offerings? After WWII, there was a huge influx of Italian immigrants to Argentina. This impacted the cuisine. Pizza is a typical Argentine dish, but it’s called fugazza. Pastas were popularized. In fact, the national dish of Argentina isn't beef; it’s Sorrentino, a ham-and-cheese ravioli with Reggianito cream sauce. Sausages are a big deal in Argentina; we have a huge selection of house-made ones here. Even rustic charcuterie platters—fiambres—are an offshoot of this Italian influence. What is the significance of Rural Society? In Argentina, the Rural Society is like the Kentucky Derby for cattle, a yearly event that celebrates the quality of livestock and honors the country’s heritage. People socialize and eat in massive tents. We are translating that celebration—and the communal aspect of this event—across the board.